William Chase was born in 15 Jun 1621 in Chesam, Buckinghamshire, England. He emigrated to Massachusetts with his parents William CHASE Sr. and Mary TOWNLEY. He married Elizabeth HOLDER about 1644. William died 27 Feb 1685 in Yarmouth, Mass. 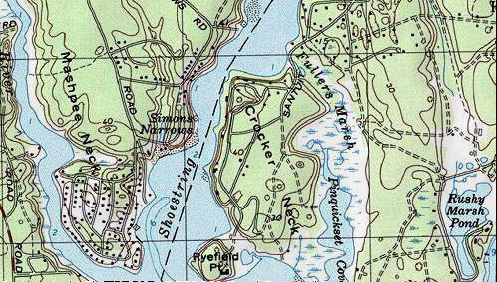 Crocker Neck Conservation Area - William Chase probably lived at Crocker's Neck, Harwich. Elizabeth Holder was born about 1625 in Winterbourne,,Gloucestershire, England. Her parents were Christopher HOLDER and [__?__]. Elizabeth died about 1678 in Yarmouth, Mass. Portsmouth, RI Before 4 Apr 1758 Swansea, Mass. William came with his parents with the first company in 1630. The Great Migration Begins says he was a child of ill qualities, & a sore affliction to his parents. William was a residence of Swansea, Bristol, Mass. Legend says there is Indian blood in the Chase family line. Which of the wives was the Indian is unknown at this point. William’s first wife Hannah Sherman was born 11 Feb 1647 in Portsmouth, Newport, Rhode Island. Her parents were Philip Sherman and Sarah Odding. Hannah died 9 Oct 1717 in Dartmouth, Bristol, Mass. William’s second wife Priscilla Berry (Perry) was born 1638 in Yarmouth, Barnstable, Mass. Her parents were Aaron Perry and [__?__]. For the hire of horses, the loss of arms, ammunition and money, loss in saddles and bridles in the Second expedition to Narragansett (Great Swamp Fight Dec 19, 1675)— William Chase (not sure if the father or son) was paid £3 16 00. Jacob’s wife Mary Hall was born 1650 in Westerly, Newport, Rhode Island. Her parents were Isaac Hall and [__?__]. Mary died 1734 in Swansea, Bristol, Mass. Abraham was a weaver and a Quaker. He had land east of Coy’s Brook and house 24 SEP 1695 Harwich, Barnstable Co., Mass which he sold for 18 pounds to William Cahoon of Chatham/Manomoy. Benjamin’s wife Amy Borden was born 30 May 1678 Portsmouth, RI. Her parents were John Borden and Mary Earle. Amy died 1716 Freetown, Bristol, Mass. Joseph’s wife Sarah Sherman was born 24 Sep 1667 in Portsmouth, Newport, RI. She was the other Sarah Sherman’s first cousin. Her parents were Samson Sherman and Isabel Tripp. Sarah’s aunt Hannah Sherman married Joseph’s oldest brother William. Sarah died 19 SEP 1748. 2. William Chase d. Feb. 27, 1684/85, at Harwich, Cape Cod. The record of his marriage and dates of birth of his children were probably destroyed when the Yarmouth Town Records were destroyed (see testimony of John, No. 6). He probably lived at Crocker’s Neck, Harwich. another account says his family lived near Herring River, on the east side of Bass River, in Yarmouth, now Dennis or Harwich. His children, b. probably 1645-1670, were connected with the Society of Friends in the neighborhood, and undoubtedly attended meeting at Friends’ Meeting, established in second month, 1681, at the house of Ivory Jones and John Dillingham, at or near Bound Brook. All his children, except John and Elizabeth, are found in Rhode Island, from 1680-1701. Abraham, the last one to change his residence, sold land in Harwich in 1695, and in 1701 was a member of Rhode Island Friends’ Meeting. They were all named in R. I. Monthly Meeting Records, except Jacob. About 1700, William, Jacob, Joseph and Samuel went to Swanzy and were there members of the Society of Friends until their death. He paid ^3,7s. 2d., in 1676, toward the expenses of King Philip’s war. He was ancestor of the Swanzy and Somerset branches. He did not serve in King Philip’s war, because the William Chase who served in that war was alive in 1735, whereas this William d. 1684-5. “was evidently his son William who died 1737. He was on the tax list for 3s., 6d., in 1676, and a townsman, 1679. William Chase, Jr., March 6, 1654 5, was presented for entering the house of Richard Berry and taking by violence a parcel of flax and a small parcel of house yarn; sentenced to sit one hour in the stocks on training day. Estate settled June, 1685, by John Thatcher and Barnabas LOTHROP. This entry was posted in 13th Generation, Dissenter, Double Ancestors, Immigrant - England, Line - Shaw and tagged Yarmouth. Bookmark the permalink.